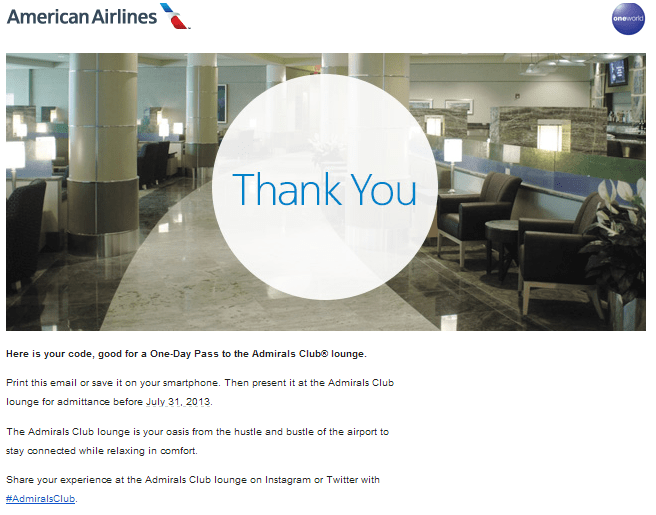 I didn’t expect this, but a reader said he had another AA lounge pass (from klout) for me to give away! So to win this, please like my facebook page and comment in this post on where you would go if you had 200,000 AA, UA, or DL (gasp!) miles and what airlines you would take and retweet my tweet! One lucky wonder chosen randomly by random.org will get the pass. And I really hope the lounge pass hasn’t been used yet! Open jaw Delta Award for 150,000 on Air Tahiti Nui and Virgin Australia with stops in Papeete, Auckland, and Sydney. Use rest of miles from AA for one way between Auckland and Sydney. I would use the miles to go to Chicago to visit my family. With 200,000 miles I would defiantly use that to go to Atlantic City. Never been there and it’s on my bucket list. UA miles I’d do Europe with the wife in business. Thailand I think. A family if four can run through 200k miles pretty fast! Delta round the world award! Easter Island and Patagonia, with a stop in Punta del Este for me and the wife. I love the challenge of awards on Delta … so I’d take the 200k Delta miles and use them on 2 Biz class seats to Paris with a few day stopover on the way back in Amsterdam (maybe via KLM). Singapore on Singapore with family.